Bed Bath & Beyond is an iconic home furnishing chain store. While their core product offerings are primarily for the bedroom, bathroom, kitchen and dining room, they have expanded their online catalog to include gardening and lawn care, jewelry, baby products and more. Bed Bath & Beyond's drop-ship program allows vendors to sell products on Bed Bath & Beyond's website. Inventory feeds will keep available quantity updated, and customer purchases will be forwarded to the vendor for fulfillment. Seller Account with Bed Bath & Beyond. Configure Bed Bath & Beyond's settings. Configure Bed Bath & Beyond's Shipping Method Mapping. Complete the CommerceHub EDI Test Environment. Seller Account with Bed Bath & Beyond - Bed Bath & Beyond purchases products through dedicated buyers, so you must contact them to become an approved seller and connect with a buyer. You submit a catalog file to the buyer, who decides which products to purchase and negotiates a price. Like other fulfillment channels, you do not post items to Bed Bath & Beyond from SellerCloud; rather, SellerCloud is used for inventory and order management. CommerceHub Account - To integrate with Bed Bath & Beyond, you must open an account with CommerceHub.com, the software they use for document transmission. This integration transmits EDI documents via SFTP connections. (SellerCloud is not currently supporting integration via VAN connections.) You will be assigned a Partner Setup Specialist who will work with SellerCloud Support to integrate your account and get you live on Bed Bath & Beyond. Be sure to determine if you will be using an SFTP. CommerceHub will ask you to provide a Customer ISA Qualifier and Customer ISA ID. See below for those values. Note: See instructions about setting co-op fees here for dropship. Navigate Company Settings > Bed Bath and Beyond > General Settings. Customer ISA ID - Arbitrary number. Typically, the clients phone number is used. Select Enable Secure FTP (SSH) - If using SFTP. BedBathAndBeyond EDI FTP information - Provided by CommerceHub. FTP Port (default 990, 22 for SFTP, leave zero or blank for auto). Choose Test FTP Credentials > Go from Select Action menu. Enable the automatic control settings. CommerceHub will create 7 test orders for the test environment. Download these orders into SellerCloud. On CommerceHub, find the packing slips on the home page and download them. Follow the CommerceHub instructions for each order. Note: Orders should be shipped through SellerCloud. Any order involving cancellations should be managed through Commerce Hub, including partial cancellation orders. After completing the test environment, CommerceHub will move the account to production. Switch the Bed Bath & Beyond FTP Server path to the production URL. Enable the Inventory Control setting and save. Important! For available inventory to upload, the product must be Bed Bath And Beyond Enabled on the Bed Bath & Beyond properties page; otherwise, an inventory of zero will upload for that product. You can easily bulk-update products by choosing the column header "BedBathAndBeyondEnabled" from the template's Select fields you want to update dropdown list. The expected column values will be either True or False. 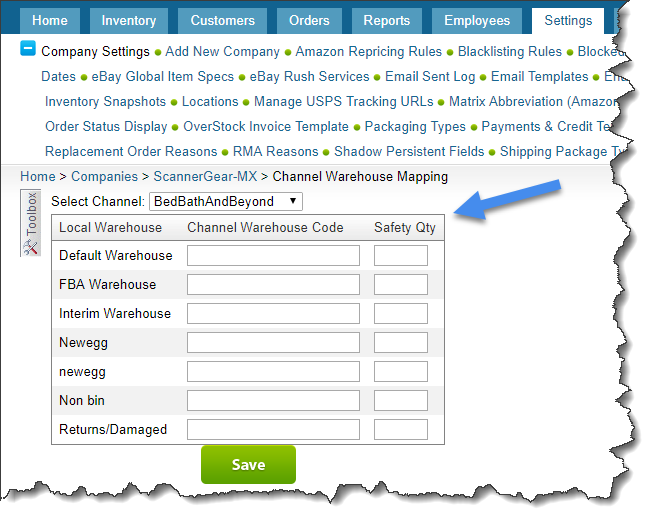 If you have multiple warehouses on CommerceHub that you want sent in inventory updates, you must map the warehouse names to Bed Bath & Beyond. Show me where. 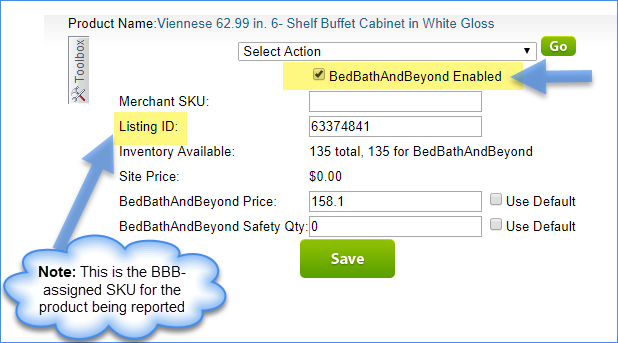 In the company's Toolbox > choose BedBathAndBeyond from the Select Channel list > enter the CommerceHub warehouse name of each warehouse > Save. Also, you can enter a safety quantity for the warehouses if desired.